Well, this is a bit of a surprise isn’t it? 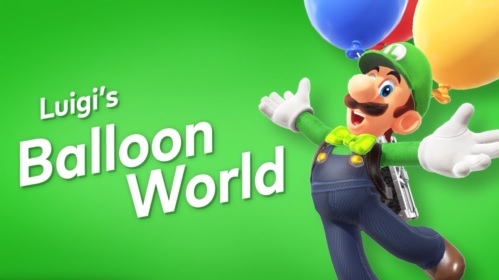 Just hours after announcing Luigi’s Balloon World would be released for Super Mario Odyssey that week, Nintendo pushed out the update on the eShop that very night. 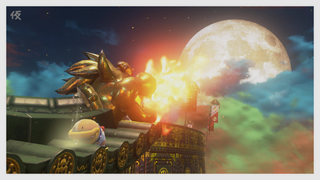 And for a free update, there’s quite a bit to experience with this one, with various extra features being added to build on the Super Mario Odyssey experience. With the first and foremost examples on the list obviously being Luigi’s Balloon World. A mini game of sorts that can be played by talking to Luigi in any kingdom, this mode has you either hiding balloons in levels for others to find, or tracking down theirs in exchange for coins. It’s quite fun to be honest, and feels a tad like Toad Rally from Super Mario Run in terms of the ‘quick play’ experience side of things. There are also various new costumes in the game too. 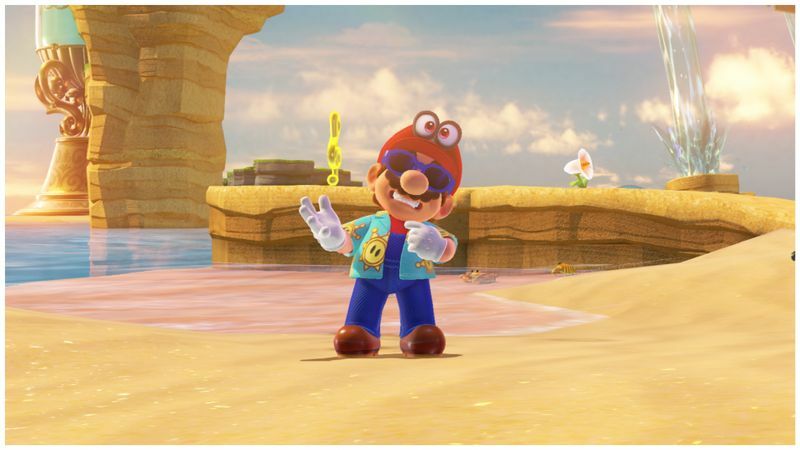 Like the musician outfits from the Metro Kingdom, a set of knightly armour that seems perfect for the Dark Souls esque Ruined Kingdom or Mario’s sunglasses and Hawaiian shirt from Super Mario Sunshine. But that’s not all. 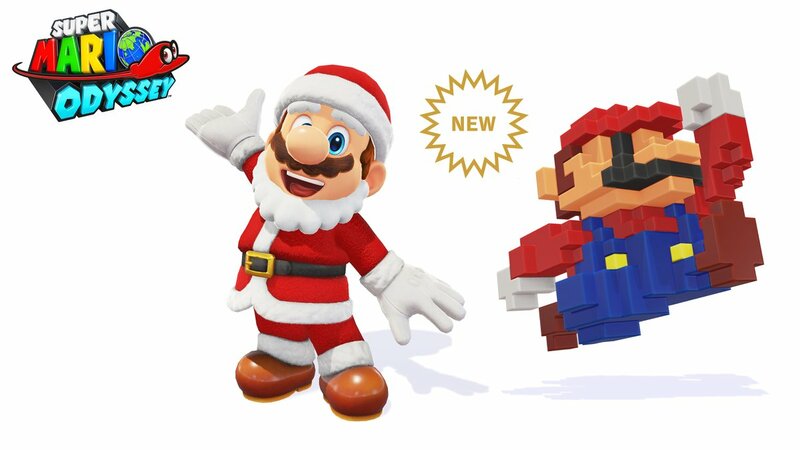 Because as it turns out, the update didn’t just bring Luigi’s Balloon World and the new costumes. Oh no, it also brings a few lifestyle changes too. For instance, you know those Hint Art pieces you find in the kingdoms? Well beforehand, it was rather unclear whether you actually solved them or not. You just guessed you did, then came back if the Moon count was off god knows how many hours later. It was a pretty awkward process, and a very clear example of ‘guide dang it’ in a modern Nintendo title. However, that’s now been made a bit more convenient. Why? Cause there’s now there’s a nice Moon icon that appears on the Hint Art whenever you find the corresponding Moon. So, yay, 100% completion is now a bit less tedious! And the screenshot mode has gotten a few new features too. Want to make everything look like a neon sign? Go right ahead, it’s available there now. As are a few things even Nintendo isn’t publicising all that much. For example, do you remember the Jump Rope Challenge mini game? The one everyone got ridiculously high scores on thanks to a handy glitch? Well it seems Nintendo patched that one. Because not only does the Talkatoo glitch not work anymore (stopping the bug from being used in the future), but the scoreboards have been wiped out as well. Hence anyone who used it won’t be seeing their 99,999 score at the top of the board any more. Other glitches have also been patched by the update as well, for better or worse. For instance, the bug that let you skip the Darker Side of the Moon by having a frog swim to the end doesn’t work anymore either. Nor does the Gushen Clipping in Seaside Kingdom, anything involving nuts in general or the Time Stop glitch in any kingdom it can be found in. Plus added various death barriers and mini game esque loading screens near other bugs as well. Can’t be doing that moped clip in the Mushroom Kingdom in Luigi’s Balloon World! Or going through certain walls in the Cascade Kingdom. It’s quite the list of changes for a game like this, for better or worse. And go and download the latest update if you’re interested. It’s completely free and adds quite a bit to Super Mario Odyssey, so unless you’re a speedrunner, there’s not really much reason not to update at this point in time. Have fun hiding and finding balloons in the kingdoms!